We surrender your package to the shipping company the same day we receive your order, if you place your order by 3 PM Pacific Time, Monday - Friday for UPS or FedEx shipping, or by 10 AM for USPS (US Postal Service) shipping. 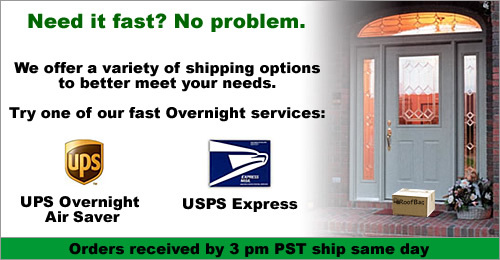 If you place your order after these times, or on a weekend or holiday, your package will go out the next business day. ** CANADA DESTINATIONS: Note that UPS Standard service may charge the customer a Customs Brokerage fee as high as $31 when delivering the package, in addition to the shipping fee paid during purchase. The other services listed don't charge this fee. Also, please be aware that Canadian Customs occasionally can hold a package for up to two weeks. We must collect sales tax (8.25%) for orders shipped within the state of California. Otherwise, there are no other charges. Yes. Packages shipped with UPS or FedEx can be tracked while they are in transit. Please see detailed tracking instructions by clicking on the green "Tracking" menu tab.